Buy Oatly Organic Oat Drink 1000ml in the UK from our online shop or directly from our independent Scottish store. This dairy free oat drink is vegan approved, contains no added sugar and is full of betaglucans which are great for your heart. Easy Peasy recipe for making porridge to soak up flavours overnight, ready to eat in the morning! This recipe contains 250 ml Oatly Original. These tasty pancakes are made with gluten free oat flour and Mheat streaky rashers. Suitable for a vegetarian diet. This recipe contains 250 ml Oatly. This vegan lasagne uses vegan ingredients and gluten free lasagne sheets. And to make it even greener, it's made with seasonal ingredients. This recipe contains 600ml Oatly. We sell real Oatly and other Dairy Free Drinks & Creams directly from our shop in Scotland and online throughout the UK. View more products from Oatly. Where can you buy real Oatly Original safely online? If you are wondering where you can buy Oatly Organic Oat Drink 1000ml safely online in the UK, then shop with us. 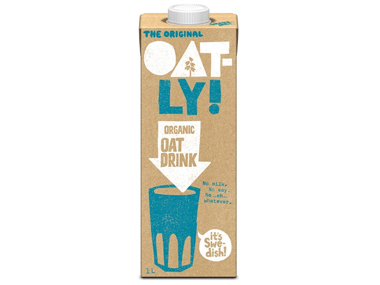 Oatly Original - Oatly Organic Oat Drink 1000ml in Dairy Free Drinks & Creams and Drinks.